Edulantern.com - The International Conference is held by Business Today, a nonprofit organization founded by Steve Forbes in 1968. This conference connects undergraduate students around the world with business executives with all expenses-paid by committee. 1. Substantial developments in technology that mark a shift from mechanized assistance to automated replacement. 2. The changing structure of the workforce, the rise of independent and fissured work, an increase in outsourcing and enhanced globalization, and the growing gig economy. 3. Stagnation of incomes in economies worldwide and increasing income inequality. Place: New York City, USA. Benefits: All related expenses (hotel, foods, flights) paid by committee. 1. Open to all undergraduate students around the world. 2. Able to attend all three days of conference (November 18 - 20th, 2018). Business Today also holding a writing competition for all undergraduates, as an alternate application to the International Conference. Students will craft an argument related to the conference theme, “The Future of Work, which grand prize winner will receive a spot at this year's International Conference. The top three winners will be published in BT's flagship magazine. Students can apply to both general conference application and the Writing Competition. They will not be penalized for whichever method they choose. To Apply International Business Conference in USA by Business Today, applicants must fill in the online application form. 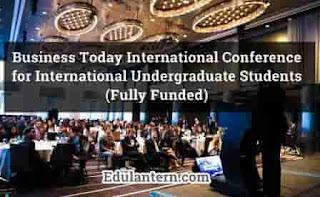 Thanks for reading International Business Conference in USA for Undergraduate Students (Fully Funded). Please share...!